MANILA, Philippines — Malaysian Prime Minister Mahathir Mohamad on Friday met a Filipino Muslim rebel leader who has become a regional governor under a Malaysian-brokered peace deal, telling him while it's easier to shoot and kill than to develop a nation, prosperity can only happen in the absence of war. 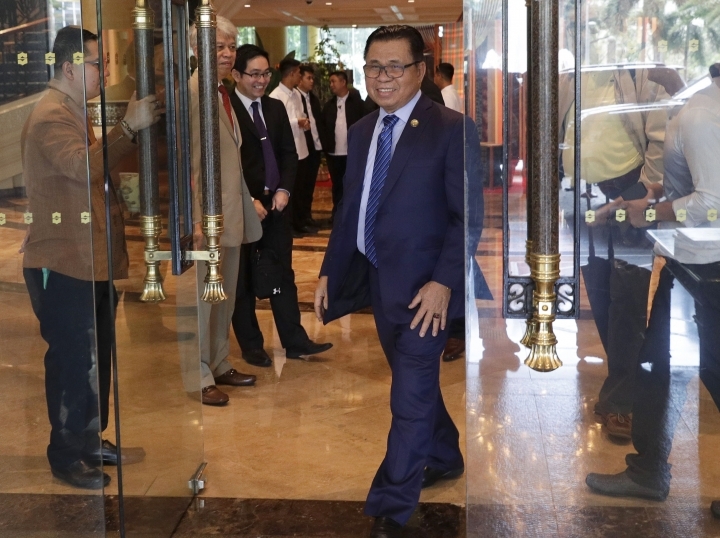 Moro Islamic Liberation Front rebel chairman Murad Ebrahim said Mahathir pledged during their meeting in Manila that his country will help ensure the success of the peace accord that transformed him and other rebel commanders last month into administrators of a conflict-wracked Muslim autonomous region in the south. Mahathir met Murad on the last day of his visit to Manila, where he held talks with President Rodrigo Duterte on a wide range of issues, including combatting Islamic State-linked militants in the largely Roman Catholic nation's southern region of Mindanao. "Prime Minister Mahathir told him it's easy to shoot and kill, but it's difficult to develop. 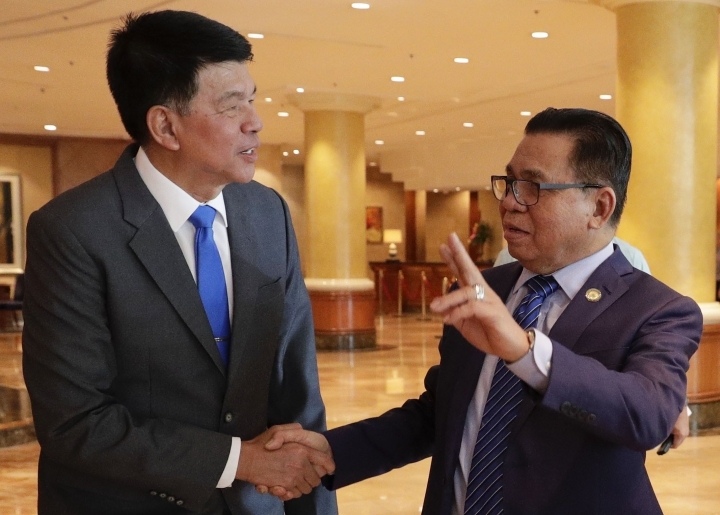 Chairman Murad said 'Yes, that is the next level of our struggle, how to develop and transform our revolutionary organization,'" said Nabil Tan, a Philippine official who joined the meeting. Murad said Mahathir told him, "If there is peace, then everything will come ... He really encouraged us." "I explained to him our priorities, the challenges. Part of the challenges is our transformation from revolutionaries to this governance. We want to have programs that will benefit the people," Murad told The Associated Press. Under the peace deal brokered by Malaysia, Murad's group gave up its goal of a separate Muslim state in exchange for broader autonomy. The 40,000 fighters and at least 7,000 firearms that Murad's group has declared are to be demobilized starting this year in three phases depending on progress in the agreement's enforcement. The first huge batch of about 12,000 guerrillas and their firearms would be demobilized in two to three months, Murad said. Murad's people, including fierce Muslim commanders still facing criminal cases for past attacks, were sworn in last month to comprise 41 of 80 regional administrators, who would lead a transition government for the five-province region called Bangsamoro until regular leaders are elected in 2022. Duterte picked his representatives, along with Muslim rebels from another group, to fill the rest of the transition authority, which will also act as a regional parliament. The Philippine and Western governments see effective Muslim autonomy as an antidote to nearly half a century of Muslim secessionist violence, which the Islamic State group could exploit to gain a foothold in the region. Bangsamoro replaces an existing poverty-wracked autonomous region of more than 3.7 million people with a larger, better-funded and more powerful entity. An annual grant, which could reach more than $1 billion, is to be set aside to bolster development in a region that has little infrastructure and is deeply scarred by decades of fighting. Smaller but more violent groups aligned with the Islamic State group like the Abu Sayyaf still threaten the region. During talks with Mahathir on Thursday, Duterte thanked Malaysia for brokering the peace talks. The Malaysian leader pledged to continue helping. A Malaysia-led team of 28 international peace monitors will remain in the south until all Muslim guerrillas have demobilized under the peace deal, Malaysian officials said. The European Union, Japan and Brunei have contributed personnel to the peacekeeping contingent, which has been credited for enforcing a yearslong ceasefire and helping ease major fighting in the past.